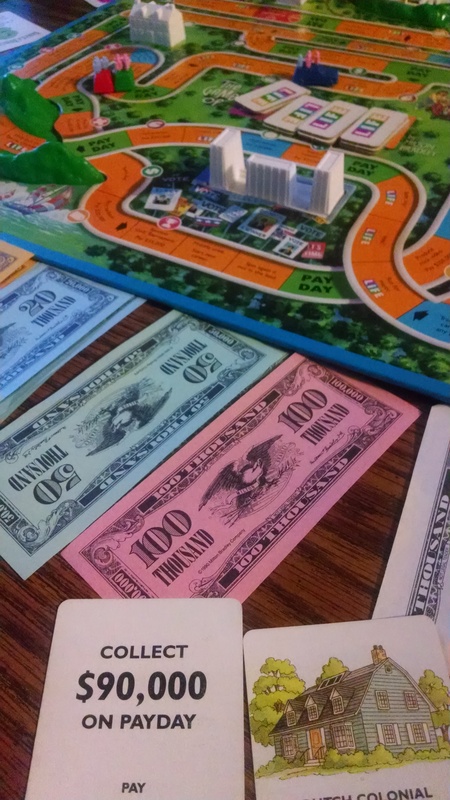 A couple weeks ago I was soundly beaten at the game of LIFE. However, my nine year old friend would surely admit it was a “cheater’s game.” But despite the loss, I’d say LIFE still ended pretty well for me. I mean a husband, two sets of twins, $90,000 a year salary, a dutch colonial home, and a lovely retirement at Millionaire Acres—what else could a person ask for? Wouldn’t it be nice if life was like LIFE? I pondered this as we spun the dial and took our chances. Well, if life was like LiFE I’d be able to see the whole board. I’d get to look down a fork in the path and make a decision based on a desired outcome. Sure there would be some risks, but the end of the game is almost always desirable. Pitfalls exist in the game of LIFE, but I couldn’t see any real tragedies. A tree may fall on my house, but hey I have insurance so all is well! It’s a quick, easy fix with zero emotional turmoil. There are no stillbirths, no terminal illnesses, no adultery, no death. And at the end of the game the one with the most money wins. Yep, LIFE would be good. It didn’t take long for me to answer with an emphatic no. If life was truly like LIFE existence would be futile. A good retirement? You’re telling me that’s it? There’s nothing else. All the toys and riches would fade at death. That’s the end. Life would be shallow, one dimensional without the beauty of complex emotions and devoid of depth and meaning. It would presuppose that I am God. Or that luck is God. When I’m honest with myself, how utterly hopeless I would be without a Sovereign King who reigns over all! How overwhelmed I would feel with the responsibility to control everything. Also, I’ve known deep love. And I would never trade it for a simple mapped out, easy path. But what about sorrow? Yep, I’d keep that too. It’s fire that makes silver a precious metal, refined and purified. that comes from knowing I am not God. No, I would not want life to be like LIFE. For I have a God with whom it is impossible to compare a mere spin of the wheel. I have a God who is sovereign (ruling, in control) over every domain. I have His words given to me. Not my plans, but those of the Sovereign God who reigns. Because God came to us. He who knew no sin became sin, that I might become righteous. God doesn’t say come up the preverbal mountain! He came down it instead. I trust Him because of who He is. I trust Him because I know HIm. I trust Him because of what He accomplished. I am able to trust Him because of the power of the cross of Christ. For the redeemed in Christ, whatever the path, whatever the joy and sorrow, whatever the longings, frustrations, and turmoil, we can rest in knowing they are under the cover of His steadfast love and faithfulness. So give me real life with all its messiness. This is not the end. I’ll take the confident expectation that one day Jesus will return, heaven will come to earth, and all will be made new. Every knee will bow and every tongue will confess that Jesus Christ is Lord. And after this the judgment. I will stand before God with Christ before me, the One who already took my place. What a fearful thing if not. Give me real life found only in Jesus. Give me eternity with Him. And there will be no stillbirths, no terminal illnesses, no adultery, no death. Yep, I’d take life over LIFE any day.